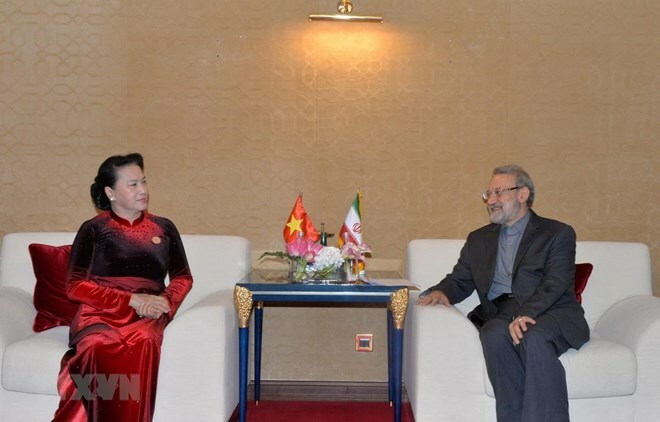 Hanoi (VNA) – National Assembly Chairwoman Nguyen Thi Kim Ngan met with Speaker of the Iranian Parliament Ali Ardeshir Larijani on April 8 on the sidelines of the 140th Assembly of the Inter-Parliamentary Union in Doha, Qatar. The Iranian top legislator recalled memories of his visit to Vietnam in 2018 and expressed delight at the partnership development between the two countries and parliaments. NA Chairwoman Ngan congratulated the Iranian government and people for maintaining socio-political stability and achieving economic progress. Vietnam and Iran celebrated the fruitful outcomes from the ninth meeting of the Joint Committee, while agreeing on various measures to enhance cooperation in different areas such as agriculture, aquaculture, energy, mining, oil and gas, telecommunications, and banking, she noted. Ngan said she hopes that the two sides will continue coordinating closely to organise the 10th meeting of the committee within the year, and work out solutions to boost bilateral affiliation. The Vietnamese NA leader also proposed that the two sides work harder together to complete the target of 2 billion USD in trade. She suggested that the two countries prioritise the trade of each other’s strong products, deal with payment problems to support trading activities, encourage businesses of both sides to study each other’s market, and promote trade and investment partnership. Agreeing with his Vietnamese counterpart, Ali Ardeshir Larijani held that banking cooperation is key to a successful partnership. However, Vietnam and Iran have yet to make any negotiations or discussions in the field, he noted, stressing the need for the two sides to develop collaboration. Ngan said that Vietnam hopes Iran will continue its provision of scholarships for Vietnamese students in Persian studies and other sectors; maintain the exchange of lecturers and students among universities; and strengthen ties in culture and tourism by holding painting exhibitions, film screenings, musical performances, and Iranian cultural days in Vietnam and Vietnamese cultural days in Iran. The Iranian Parliament Speaker said that he will assign his assistants to work on the providing of scholarships to Vietnamese students and send notice to the Vietnamese side in the next few months. He added that following his return, he will discuss with the Iranian Minister of Culture on the organisation of cultural days in each country, and suggested that Vietnam and Iran increase the import and export of fruits and farm produce to each other’s market, paying more attention to agricultural cooperation.